If only I like the books….sigh Not as a kid, not as a parent and not as a teacher. 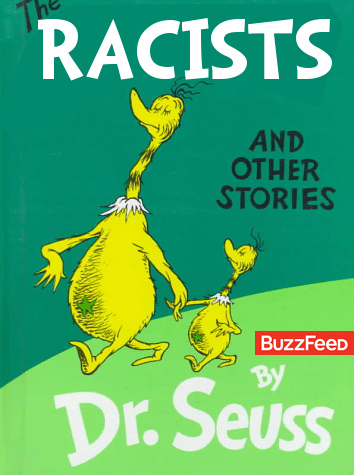 What blows me away about “The Sneetches” is that this was a children’s book that was ABSOLUTELY about racism (I know, I know, you can read it as being about bullying but you’re reading it wrong — it’s about racism) that was published in 1960 and created (so far as I have been able to find out) nary a ripple of controversy. It is one of my favorite examples ever of a book with a message that flew below the radar of the people who would have tried to stop it. I think “What Was I Scared Of” is also about bigotry (fear of the unknown, rather than feelings of superiority). And although this one’s a stretch, I like to read “The Zax” as a metaphor for the U.S. Senate.